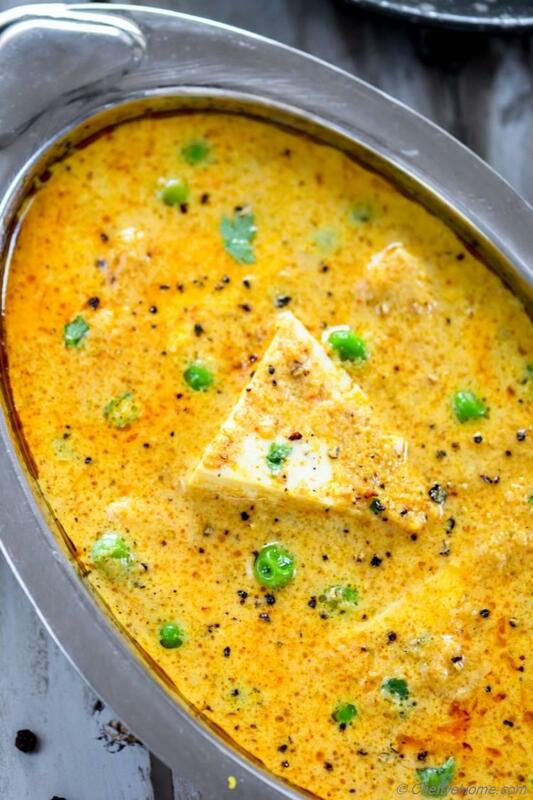 This creamy Indian paneer sabji (curry) has been cooked in vacuum (dum) to infuse the peppery flavor of fresh black pepper! This curry is meant for all black pepper (kali mirch) lovers! Seriously, aroma of the infused fresh black pepper is much more pronounced than just sprinkling the pepper at the end. 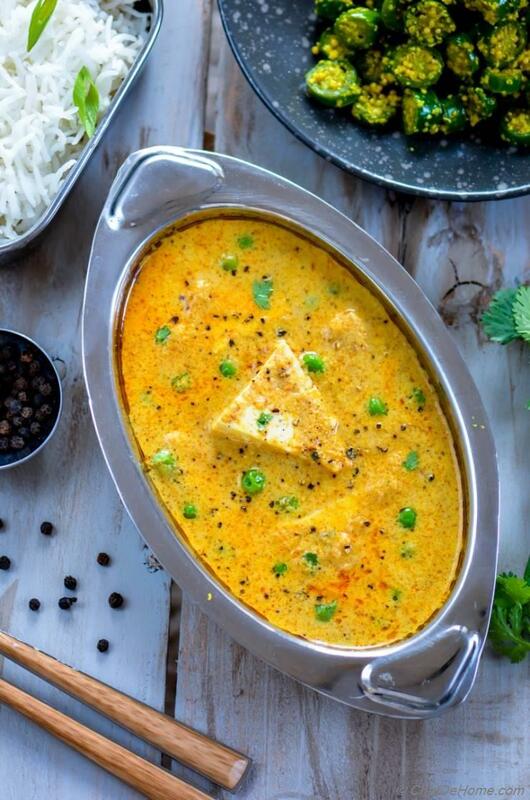 Oh, and Dum Paneer curry comes together so fast..... you won't hesitate a second to serve it on weekdays! My idea? Make gravy during the weekend and just add your choice of protein before serving! Indian Paneer, tofu - soy paneer, or even chicken! This gravy makes any protein extra special! Friends, accept my apologies for my blog erroring-out and me not showing up all last week. I had a very bad experience with unexpected down-time of my blog's hosting provider. Seriously, a nightmare! Thanks God I had backup of blog or it would have been a disaster! Dum (cooking in vacuum) is very popular mode of infusing flavor in many cuisines. I'm sure you are familiar with "Biryani". "Dum" is the traditional techniques of cooking Biryani. It infuses the flavors of ingredients so well that you can't imagine getting same flavors in normal pot cooking. In vacuum, nothing escapes the cooking vessel, steam keep circulating through-out food and hence intensifies the overall flavor. That being said, it is not so hard to cook in "dum" at home. Just by using a tight lid vessel and sealing the edges with raw dough or aluminum foil does the trick! 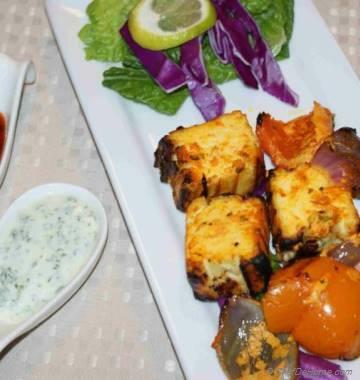 I have vivid memory of first-time eating Dum Paneer Kali Mirch about 15 years ago in a restaurant in India. Oh, that black pepper flavor!! I think, I became huge fan of black pepper after that one experience! Actually, I love love kalimirch(black pepper) and add it to almost everything I eat!! Sometimes even desserts! ;-) I guess I did share about my passion for Kali Mirch when I posted Black Pepper Pistachio Ice Cream Pops! :) Seriously, not just because I love it.... Black Pepper is actually very good for you. It helps in digestion, is good for eye-sight, plus can take any food from fab to fabulous! "Dum Paneer" Or "Dum Kali Mirch"? For this curry, gravy has been cooked in dum not paneer. I'm not sure if I should have called it "Dum Paneer" Or "Dum Kali Mirch"? :) So, I picked one title randomly. However, there is a reason, I didn't cook paneer in dum... I used Soy paneer a.k.a. Tofu. Tofu is very delicate in texture so I added it to the curry after cooking. 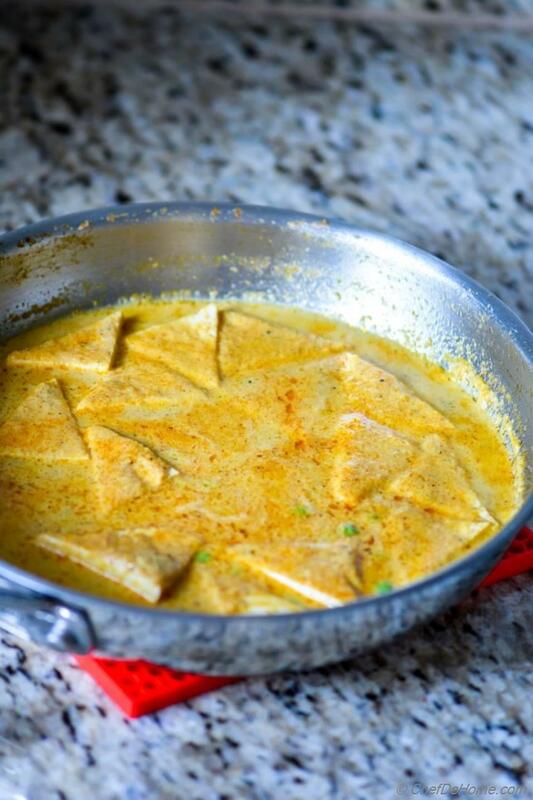 If you using milk paneer, you can add it to curry before sealing the pot. This way paneer will also have more infused black pepper flavor! 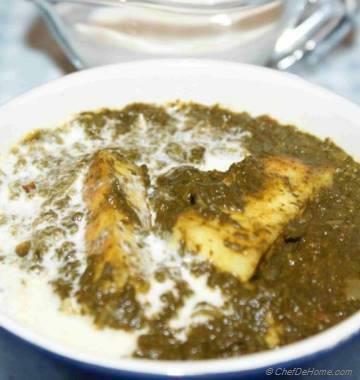 I love to serve Dum Paneer Kali Mirch with side of rice and few Indian whole wheat rotis (flat breads). You can also serve this sabji with Indian naan bread. 1. Paneer Dum Kali Mirch is Gluten Free. 2. It can be made vegan. 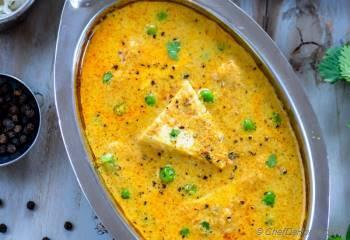 Just use tofu instead of paneer and low-fat coconut milk instead of yogurt and heavy cream. Few Homemade Indian Flat Breads to enjoy with Panner Dum Kali Mirch! Total Time 28 minutes Prep Time 5 minutes Cook Time 23 minutes Difficulty Easy Yields 2-3 Servings Serves 3 Notes No. of servings depends on serving size. 1. 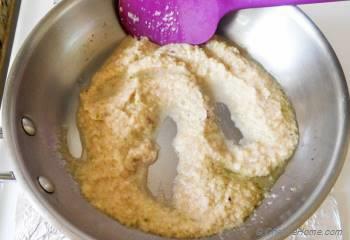 Blend onion, ginger, and garlic in a food processor to make fine puree. 2. 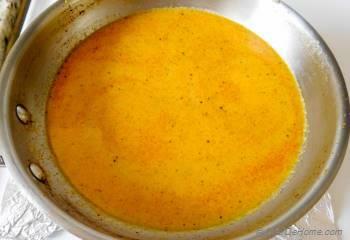 Heat oil in a pan, add puree and saute until water evaporates and mixture start to get very light brown. 3. Low the heat, add in room temperature yogurt, little at a time and mix after each addition. 4. Add spices (black pepper, paprika, turmeric) and saute for 30 seconds. 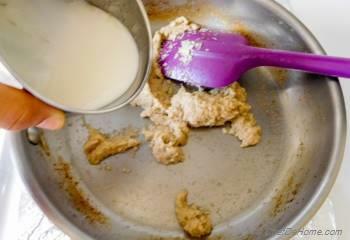 Don't worry if masala sticks to bottom of pan, this will come out when we add(de-glaze) the pan with water. Keep the heat, medium-low to avoid burning the masala. 5. This is how it looks after 30 seconds of cooking spices. 6. Now add water. 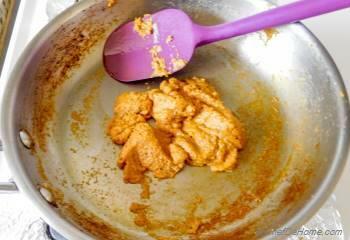 Stir to mix masala with water fully. Bring to boil and then lower heat to medium. Cover with tight lid then seal outside with some raw dough or two layers of aluminum foil. Cook for 15 minutes on medium heat. 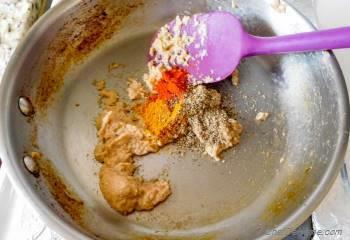 In this time masala thickens and black pepper perfumes the sauce in vacuum (dum). If using fresh green peas instead of frozen, add in this step so they cook fully. Or cook them seperatly in boiling water. 7. Remove the lid, add heavy cream, green peas, and paneer pieces. Cook for 1 more minute. I added blanched fresh green peas just before serving. 8. Remove from heat and add chopped cilantro(dhaniya). 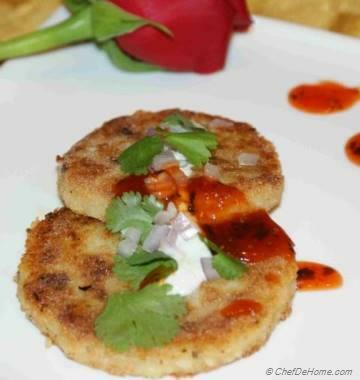 Serve with rice or Indian Roti! Enjoy! 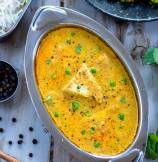 For this recipe, I use tofu or paneer very often. 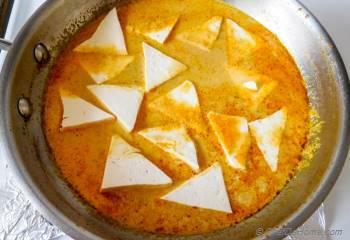 So even though recipe calls for paneer, when I took pictures I used tofu that day. Make sure to press it in paper towel for 5-6 minutes to remove extra water. Yay! You're back! Hope all is well? 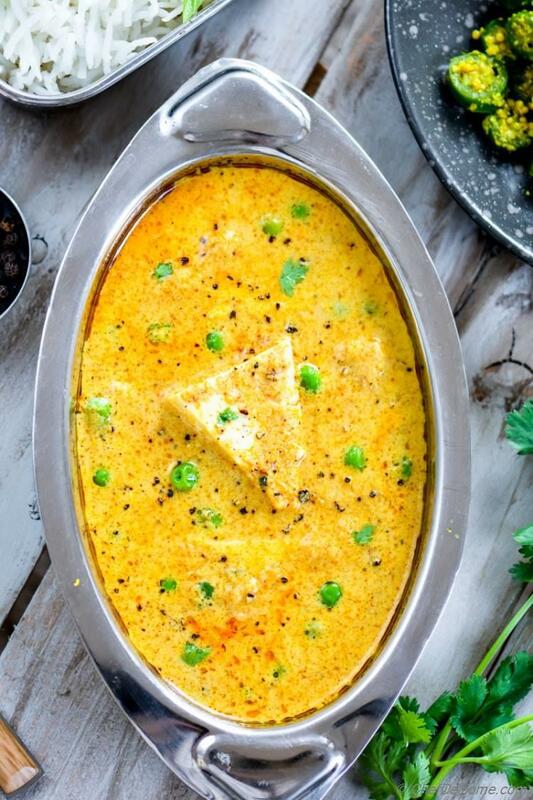 This paneer kali mirch looks delish!